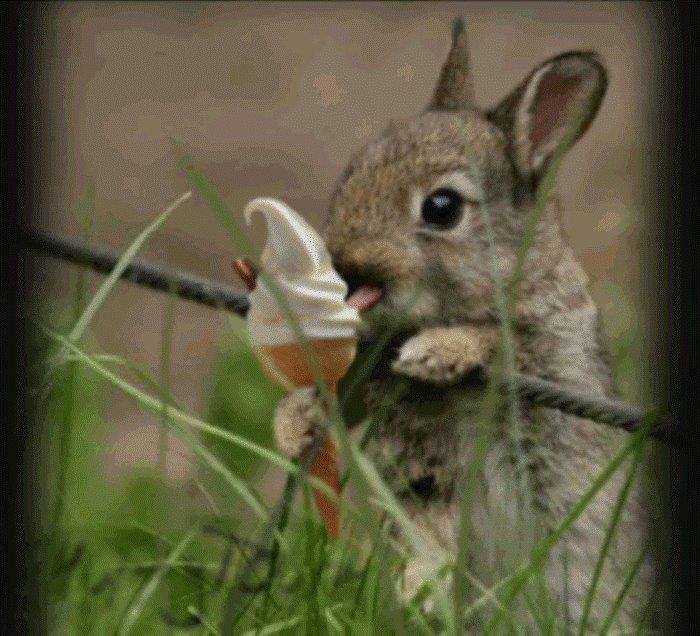 Translation:The rabbit eats ice cream. Kaninen is a false friend too, since it's a rabbit and not a canine, so we've got two pairs of false friends in this one! I just thought Sweden had some tough animals at first. AND if you know Spanish and Esperanto, you will see the connection with "conejo" and "kuniklo" respectively! English is always the odd one out. And English has the old word “coney”. So I had to look that up because in the US coney is a fish and I assumed that is where Coney Island in NYC got it's name from. It looks like it was named when that area was still New Amsterdam and was actually named for rabbits not fish. Which means we can also add konijn to the list. Aw. There is a Conejo Valley here but I bet one would be really disappointed if they were expecting rabbits. The canine eats glass. Makes perfect sense to me. "glace" is "ice" in French, an also, a miror (by analogy), and a car window. "un essuie-glace" is a windscreen wiper. Swedish rabbits! They're so strong that they can eat not only ice cream, but pure ice too! Between this and the blue bunny - we have a brand of ice cream called blue bunny in this part of the US. Listen to the vowel sounds. 'Glass' has a short vowel sound (sounds similar to the English word 'glass' (think of how the Americans say 'glass', but don't say 'gless' like an American would) Say 'glass' with an 'A' and not with an 'E' like in American English), and 'glas' has a long vowel sound (sounds similar to the English word 'gloss'). To help you, use Forvo or Google Translate for audio.